To my non reenactment readers I apologise. This post is long as it is and I realise has a bunch of assumed knowledge that I haven’t explained. I’ve seen several extant “late period” chemises with the hip fullness enhanced by gathered insets rather than the more usual triangular gores at the sides. 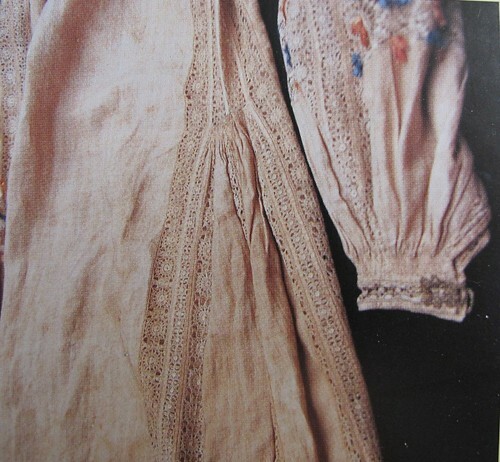 Here is one from 1660, the picture is from Janet Arnold 4. I really like them and would love to make one (or more). 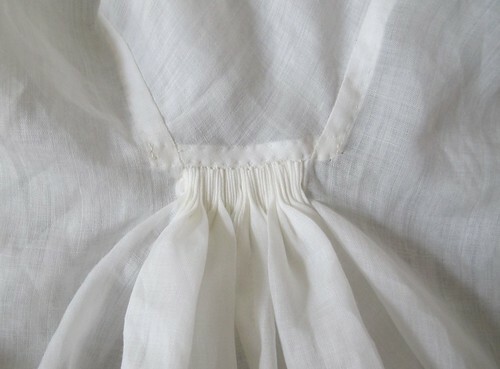 (I’ve now added a couple more gathered inset extant garments at the bottom of this post). 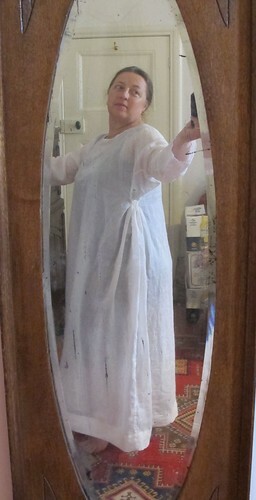 However I’m currently making and wearing early 14thC garb. 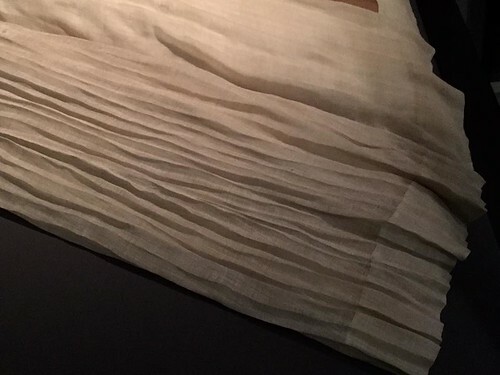 Then a friend shared photos of a fine linen alb from Switzerland dating to ~1310. Woo hoo! I thought. I’m going to use these two garments to inspire a chemise. I need another for a long event anyway and one in very fine fabric might make the too tight sleeves of my new blue gown a bit more buttonable. The picture above looked to me as if the gathered inset was set directly below an underarm gusset. I now think that is not quite the case. The extant alb has a bit more drapiness above the gathers than my version. 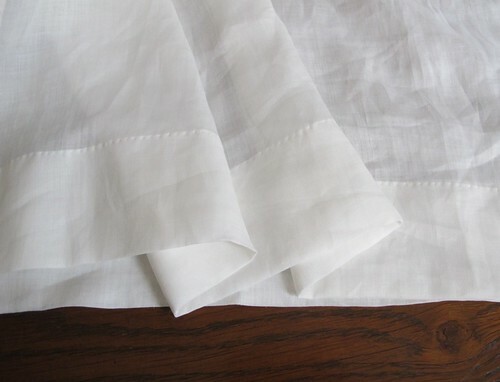 I’ve used a very fine ramie voile which I bought cheaply. 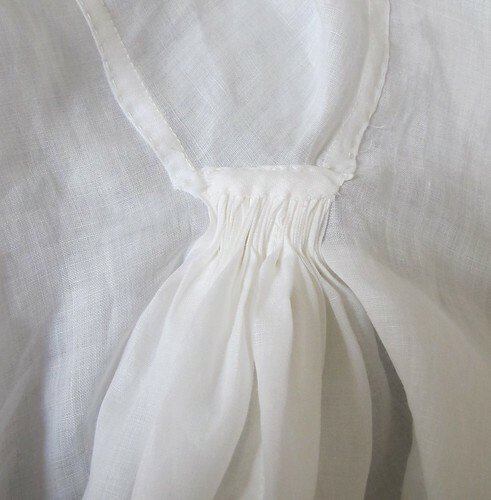 So I can make several of these if I like and not break the bank, which buying fine linen voile would, if one could even find it (the alb may well be in a particularly fine strain of linen which is now extinct). I cut out the garment, and then almost immediately wished I’d done it differently. I did the gathered side pieces cut together with the garment body. 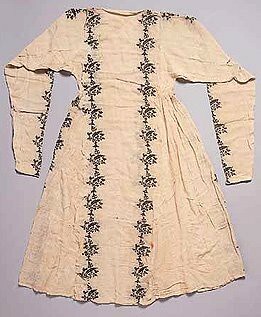 I now think they should, and would better be done as separate sections, sewn to the garment body. I did manage to hide the side seams pretty well in the actual gathers. 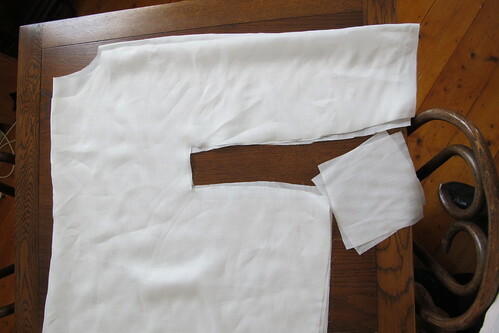 The fabric is very wide, so I was able to cut the sleeves with the body piece also. the only separate pieces were the underarm gussets and the neck facing. I constructed each of the side gathers differently. Both are cartridge pleated. The first one doesn’t have a turn down at the top of the gathered section, and is bound by the bottom tip of the underarm gusset. This came out a bit uneven, but is nice and flat. Right side, then reverse view below. 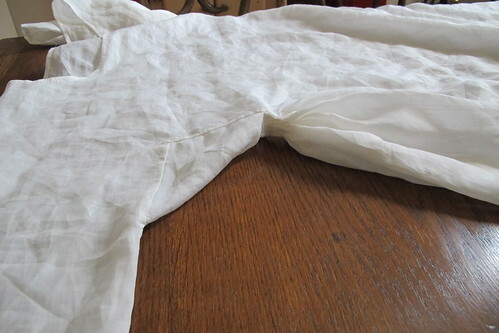 The second side came out much neater, but has more of a lump from the bulk of the pleats. I’ve turned down the top of the gathered section before running the stitches for the cartridge pleating. Then I’ve used a small piece of straight grain double fold facing (left over from the neck facing) to stabilise the gusset section the gathers are sewn to. 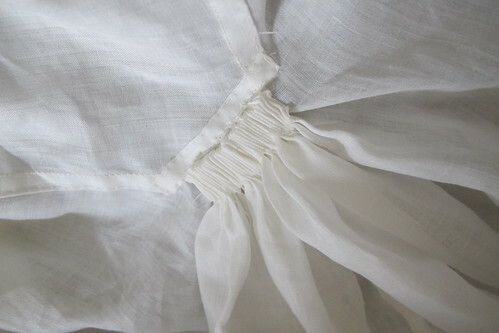 The hem is a deep (7cm) double fold. Which is a good thing to do in very fine fabric. Gives it weight so it behaves better. 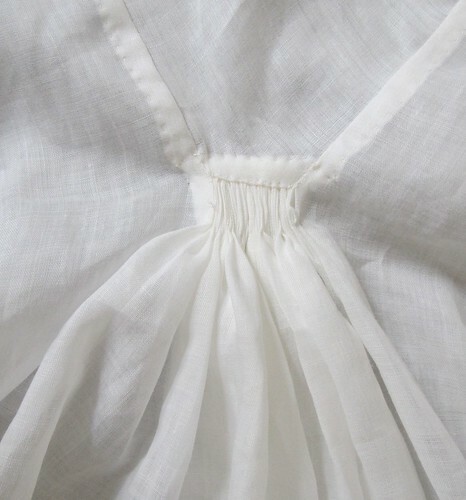 However although the alb has a deep hem, looking again that seems to have basically a double fold hem with only a small turn under at the top. Here is the whole thing on. I will wear it with the blue gown in a couple of weeks and see if the gathered sections annoy me or not. And a silly action shot, just for fun. New garments often inspire me to dance. 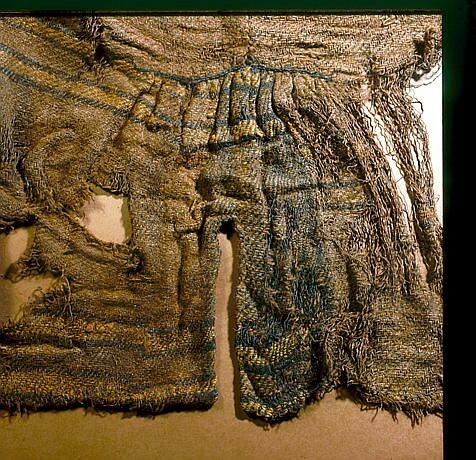 The tunic found at Guddal. I think this might be 12thC? Probably a short man’s garment. 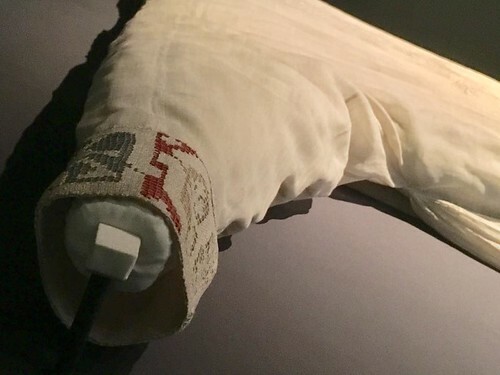 A beautiful garment from “somewhere in the middle east”. Foolish me didn’t capture the information. I will see if I can track it down. Make that 14thC Persian. I don’t understand how this would have been worn though. Repeating the prettier gathered section so it will be picked up when shared on other sites.